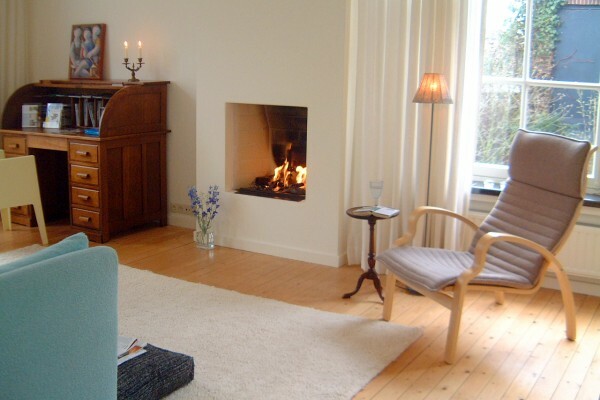 Delightful, self cathering Holiday House in the beautiful south of Holland. Situated near Venlo, Eindhoven and Maastricht. Spectacular nature and plenty of opportunity for exciting day trips. Authentic features combined with designer comfy furniture, wooden floors, art on the wall and the presence of all mod con offer a serene and unique atmosphere. Each room is individually designed. 2 double bedrooms- The Joffers' room and the Red room. 1 single bedroom- the Red room. Luxurious and spacious bathroom- large bath -shower -2 washbasins toilet. Cozy dining-room with two French doors leading to the beautiful garden. Stylish and comfy living-room with open fireplace. Modern and cozy kitchen with all mod-con. Lovely garden with 3 cozy patios- the large patio-the morning terrace and the shady sitting area underneath the old aok tree. Fantastic opportunities for walking and cycling. A stone throw away you'll find well sign posted walking- and cycling routes that lead you through spectacular nature which offers a varied landscape. Through forests and heath, fens, rosefields and along the riverbanks of the river Maas and beautiful lakes. Germany, vibrant Dusseldorf and in Belgium beautiful Gent and Brussels are great for unforgettable days. 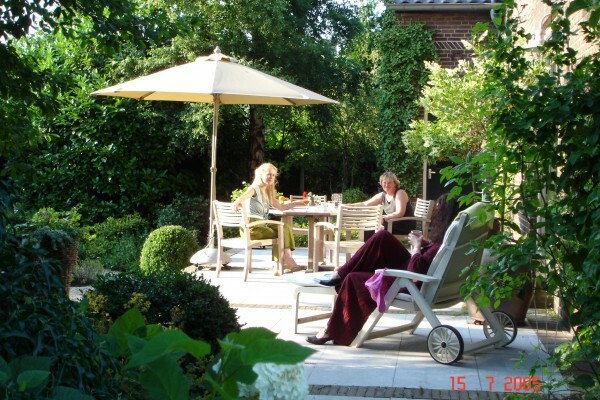 www.hethuisdejoffers.nl Info, photo's, virtual tour, tips, feedback from guests and the press, availability and safe online booking facility. -Two double bedrooms; each individual designed. -Luxurious and spacious bathroom w. shower, toilet and 2 washbasins. -Modern and sunny kitchen with all mod-cons. beautiful wooden garden furniture awaits you. Weekends: from euro 285 to euro 365. Midweeks: from euro 395 to euro 550. Week(s): from 495 to euro 695. Rental of luxurious bikes (21 gears). Info about prices- please visit our website. Click: 'Availability and online bookings'. Mieke, your hostess is more than happy to assist you with any questions. The Joffers' House is a self catering holiday house. If you wish, your hostess, Mieke can arrange a wonderful breakfast basket for you. There are various opportunities to visit local restaurants and cafes. -Plenty of lovely cafes and restaurants in the direct area. Het Huis 'de Joffers- een oase van rust-ruimte en inspiratie. Als je binnen staps valt er een soort warme deken om je heen. De sfeer is puur-verfijnt en erg gezellig. Mijn vrouw en ik hebben hier ontzettend genoten. Mieke, onze gastvrouw was enorm behulpzaam en enthousiast. We hebben o.a. veschillende prachtige fietsroutes gevolgd waaronder de rozen- en blauwe bessenroute met een stop voor een heerlijke bessen cheesecake in de 'Theetuin' in Broekhuizen. 'De Stempelroute' aan de Maas is ook een echte aanraders. Verder heerlijk genoten van het Thermaalbad en alle gezellige terrasjes in Arcen. Hier zijn we nog lang niet uitgekeken, en 'De Joffers'? We hebben nu al onze wintervakantie geboekt en verheugen ons erop om lekker te genieten voor de open haard! Een echte verrassing- een echte aanrader! Did you stay in Vakantiehuis/B&B - Het Huis De Joffers? Let us know what you thought about it and help others to make the right choice! * I confirm having stayed in Vakantiehuis/B&B - Het Huis De Joffers.